emancipation of enslaved african americans in the south became official on 1 jan. 1863, when president abraham lincoln issued the emancipation proclamation freeing the slaves in areas of armed rebellion against the u.s. government, including north carolina. although the proclamation marked lincoln's attempt to end slavery, many slaves in north carolina had engaged in actions toward the same end from the outset of the civil war. african american men constituted a large portion of the confederate labor force working on the fortifications of pamlico and albemarle sounds, as well as along north carolina's coastal rivers prior to open hostilities between north and south. but this new use of slaves separated black men from their families and subjected them to military overseers, both of which alienated many slaves from the confederacy. as the war progressed, they fled not only military labor but also confederate impressment and their owners' actions to move them away from union lines. despite the efforts of north carolina slaveholders, thousands of slaves crossed union lines to freedom. when union commander maj. gen. ambrose e. burnside launched his expedition into northeastern north carolina in february 1862, he unknowingly provided slaves with a new sanctuary. initially, burnside hoped not to become involved in the slavery issue, but on 21 march he reported to the u.s. secretary of war that "it would be utterly impossible if we were so disposed to keep [slaves] outside of our lines, as they find their way to us through woods & swamps from every side." the massive influx of fugitive slaves created tension between burnside and edward stanly, whom lincoln appointed military governor of north carolina in april 1862. stanly believed it his duty to protect north carolina law in order to promote unionism in the state. this conviction led him to disband schools for african americans in new bern, to return a local unionist planter's young female slave, and to protest the emancipation proclamation. ultimately, it was his government's emancipation policy that prompted stanly to resign on 15 jan. 1863 because he feared that it would needlessly lengthen the war. perhaps there was some truth in stanly's protests. despite lincoln's cautious path to emancipation, his acceptance of it as a military necessity in july 1862 rattled north carolinians. burnside-like other union commanders already inundated with fugitive slaves when lincoln issued the preliminary proclamation following the battle of antietam (sharpsburg) in september 1862-encountered swelling numbers afterward. the emancipation proclamation exacerbated rising class tensions in north carolina. in the wake of the confederacy's april 1862 conscription act exempting 1 white male per farm with 20 or more slaves, nonslaveholders' commitment to the southern cause waned. the north carolina press viewed the preliminary proclamation as an indication of the union's intention to abolish slavery and subjugate white men and predicted that southerners would further rally behind the confederacy. yet the opposite occurred in north carolina: class conflict between nonslaveholders and slave owners increased, as did desertion from the confederate armies. after january 1863, yeoman farmers could no longer conceive of sacrifice for an institution in which they possessed only a "casual interest." ira berlin and others, eds., freedom: a documentary history of emancipation, 1861-1867, ser. 1, vol. 1 (1985). william c. harris, "lincoln and wartime reconstruction in north carolina, 1861-1863," nchr 63 (april 1986). harold d. moser, "reaction in north carolina to the emancipation proclamation," nchr 44 (january 1967). mark e. neely jr., the last best hope of earth: abraham lincoln and the promise of america (1993). "emancipation proclamation." state library of north carolina. http://statelibrary.ncdcr.gov/ghl/themes/emancipation.html (accessed november 29, 2012). 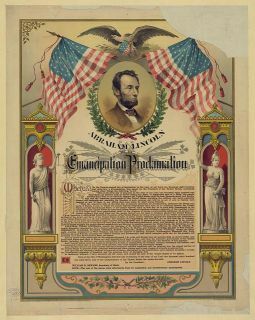 "abraham lincoln and his emancipation proclamation / the strobridge lith. co., cincinnati. " c. 1888. courtesy of the library of congress prints and photographs division washington, d.c. available from http://www.loc.gov/pictures/item/97507511/ (accessed may 21, 2012). 1 January 2006 | Nash, Steven E.